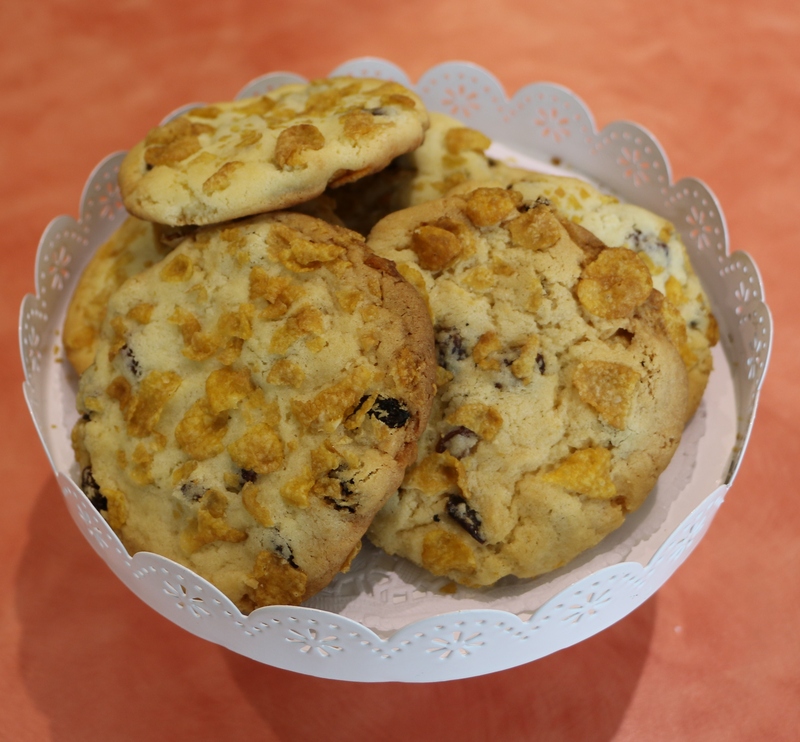 There’s truly nothing better than a Cornflake Cookie from Bake & Brew cafe to go down with a hot cup of tea or coffee. Made fresh on-site next door to the library, these biscuits are made from a simple recipe, with the perfect combination of sweetness, cornflake-y crunch and juicy sultanas. 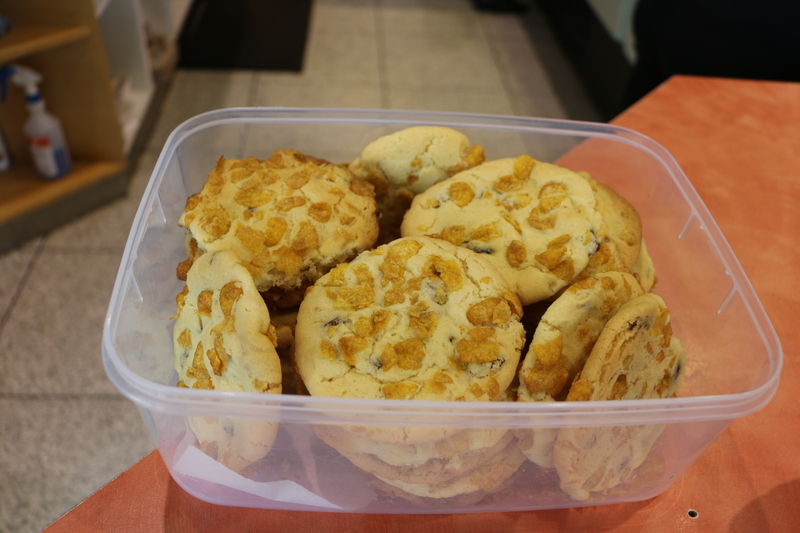 The Cornflake Cookies are made by Sue the pastry chef, who inherited the recipe from her mother. 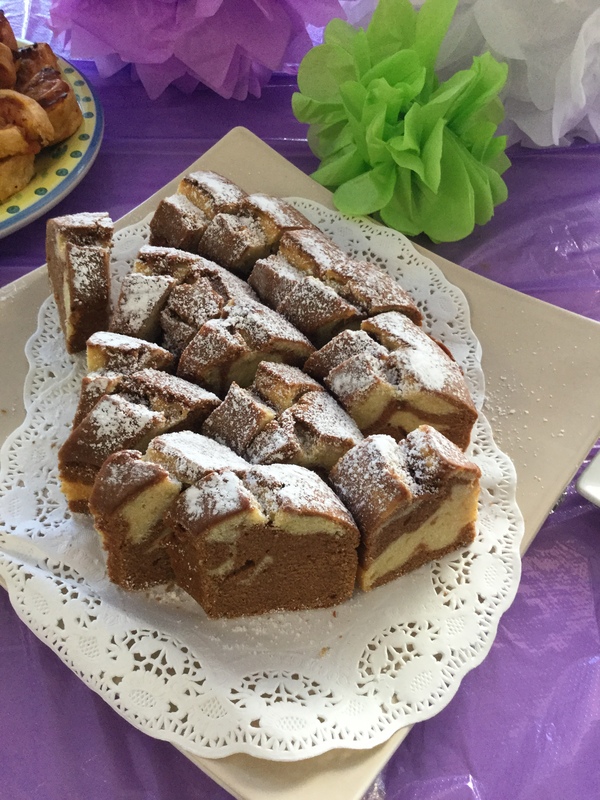 Sue recalls the recipe originally appearing in an old Lutheran Church cookbook, but wasn’t sure which one! No matter – she knows this recipe by heart as she makes a fresh batch every week. They are for sale $4 each – and now that Sue has generously passed on her recipe – you can have a go at making them yourself! A fresh batch of Sue’s Cornflake Biscuits not long out of the oven. Cream the butter and sugar. Add eggs, SR flour and sultanas. Stir until mixed. Roll dessert spoonfuls of the mixture into balls and then roll them in the bowl of cornflakes, gently pressing the cornflakes into each ball. Put the balls on a baking tray and gently press them down with your hand. Bake at 160 degrees for 15-20 minutes or until golden. Let the biscuits cool on a wire rack. Dried apricot bits and choc chips also work well in this recipe – simply substitute them for sultanas. Thanks again Sue for sharing your recipe! 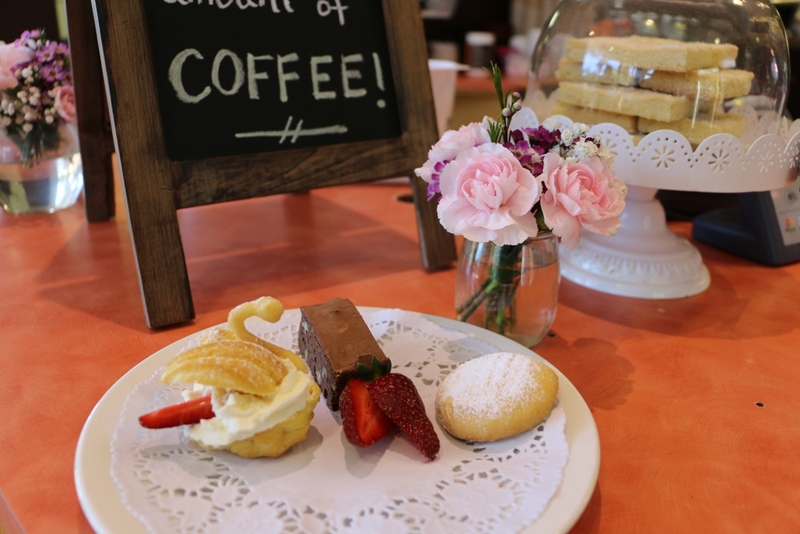 Many of our Library staff have sweet tooths and to satisfy those cravings we head straight to our neighbour cafe, The Topiary Pantry, to make a selection from the generous presentation of treats in their glass display. The Topiary Pantry is owned by the same people who own ‘The Topiary’ at Newman’s Nursery, which is renowned for its emphasis on homegrown produce and for making as many ingredients as possible from scratch. Sue, the resident pastry chef at The Topiary Pantry has kindly shared her unique recipe for choux pastry for the November newsletter. She has recently been making choux pastry for many sweet treats that have been very popular amongst customers. At the Topiary Pantry, choux pastry can be used for making profiteroles, eclairs, swans, paris brest, croquembouche and many other things. Place water and butter in a saucepan and bring to the boil. Add flour and cook out until it all comes together. Place the mixture into a mixing bowl and beat slowly. Add eggs one at a time until the mixture is smooth and glossy. Place the mixture into a piping bag with a nozzle and then it is ready for any kind of application. Cook the choux pastry at 180 degrees celcius. 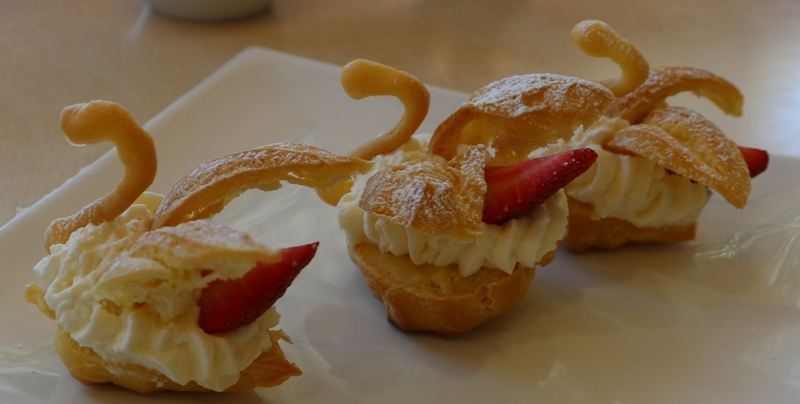 Choux Pastry Swans – a delicious light and fluffy summer sweet treat. Over summer The Topiary Pantry will be serving ‘Coffee Bites’ specials, which will feature a selection of sweet treats – perfect for a morning or afternoon indulgement. 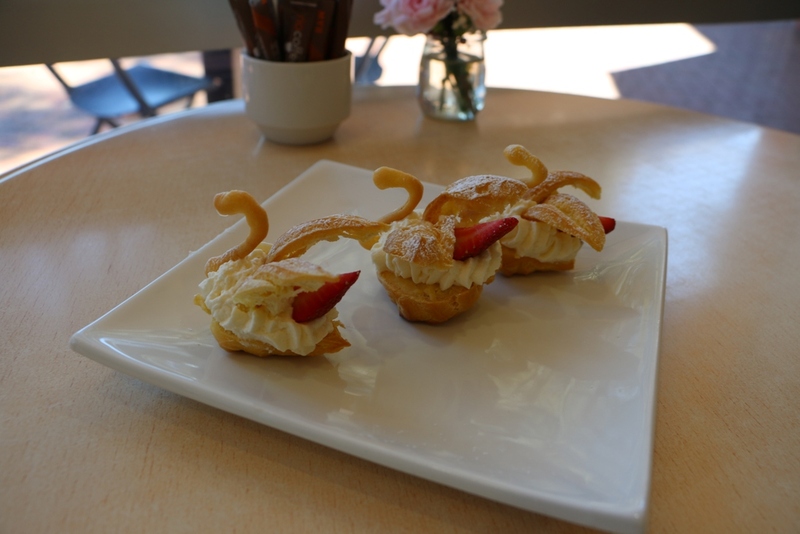 Over summer, the Topiary Pantry will be serving these bite size choux pasty swans filled with cream and strawberries, for $2.50 each or you can order the ‘Coffee Bites’ special, where you receive 3 bite-size treats for $7.